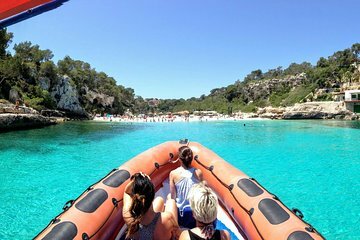 Discover the wild beauty of Mallorca’s southeastern coast on a 2-hour boat trip from Cala Figuera. Get close to rugged cliffs, ancient rock formations and sea caves once used as smugglers’ hideouts aboard a nimble vessel. See old maritime quarries and the historic fishing town of S'Almunia while your captain shares island history. Disembark on the secluded, pristine beach of Cala Marmols, where you can relax on the sand or take a swim in the clear, turquoise waters. Please bring swimsuit, sunscreen, a towel and maybe a change of clothes or bathing suit to feel comfortable and dry in the way back. Due to weather conditions all departures may be canceled without notice. The skipper has the authority on board and any changes or cancellations of trips will be for the sole purpose of ensuring the safety of our guests. Fantastic boat trip that allowed us to explore a lot of spectacular features along the coast. Many of which were inaccessible from the shore. Guide was great and he pointed out various beaches and rock formations along the way, and after snorkelling at Cala Marmols in crystal clear water he headed back to Cala Figuera at top speed! Well organised and great value. Loved this tour - great captain, stunning views and so nice to be on a smaller uncrowded boat which could access unspoilt areas. So much fun! Fantastic and very interesting boat trip: beautiful views, interesting caves and coves, great snorkeling and a really nice captain. We highly recommend it.